Topeka, Kan. – The LeadingAge Kansas Foundation announced today seven winners of our 2017 Scholarship Program. Winners will be honored at the LeadingAge Kansas Policy and Leadership Conference at the Drury Broadview Plaza in Wichita on October 5, 2017. Dayna Babler serves as the HR Coordinator at Brewster in Topeka. Dayna is pursuing her degree in Human Resources and wants to apply that knowledge in senior services. Taylor Beery is CNA at Prairie Mission Retirement Village in St. Paul. She received a scholarship to become certified as a Certified Medication Aide. Desiree Chavez is a Clinical Associate with Tallgrass Creek in Overland Park. She is pursuing her degree in nursing and eventually wants to be a Physician’s Assistant. Jessica Kootz is the Director of Senior Housing and Marketing at the Good Samaritan Society in Ellsworth. She is pursuing her license as an Adult Care Home Administrator. Paula Miller serves in the Billing Department of Pleasant View Home in Inman. She is pursuing her training and license as an Adult Care Home Administrator. Paula will receive the Bob Bethell Administrative Scholarship named for the late Legislator who was a champion for aging services. Carrie Padgett is the Director of Nursing at Lone Tree Retirement Center in Meade. She is pursuing her Bachelor of Science in Nursing. Angela Panek serves as an Accounting Assistant at KMH in Wichita. She is pursuing a Certificate as an Adult Care Home Operator. The Scholarship Program was launched in 2012 as one answer to the workforce shortage in Aging Services. To date, they have provided over $37,000 to 50 deserving individuals serving in the field. Generous donors from around the state and Central National Bank have contributed to the fund and stand beside the Foundation in congratulating the 2017 recipients. 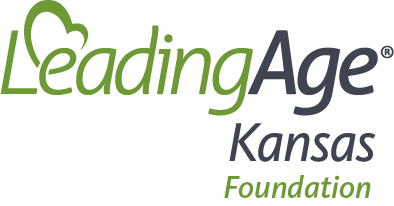 The LeadingAge Kansas Foundation was formed in 1988 to advance the health and well-being of older adults by providing research, education, training and the dissemination of information for providers of long-term supports and services. Learn more at www.leadingagekansas.org/foundation.